The Sultanate of Oman is situated on the southeast coast of the Arabian Peninsula. It borders the United Arab Emirates (UAE) on the northwest, Saudi Arabia on the west and Yemen on the southwest. It is about eight hours’ flying time from London, passing over, in order, Bahrain, Dubai and Abu Dhabi before landing at a small modern airport and landside in record time. Not part of the UAE, Oman is independent and you are made very welcome. Strategically Oman is important, bordering to the south the Arabian Sea, and to the northeast the Gulf of Oman opposite Iran. All shipping for the Persian Gulf has to pass through the narrow Straits. In fact its location has been the bedrock of the country over the years, the meeting point of traders from India and those from Africa to the south. The European explorers of the 15th century, and their colonial masters, took more than a passing interest. Oman has historically possessed Gwadar, now in Pakistan (until 1955), and also Zanzibar, subject of a bloody takeover in 1964. Very influential were the Portuguese for 200 years, Muscat, now the capital, a vital port on the way to the East. In the late 18th century the newly established Sultanate signed the first in a series of friendship treaties with Britain. Over time, Oman's dependence on British political and military advisors increased, but it never became a British colony. In 1970, Qaboos bin Said al-Said overthrew the restrictive rule of his father and has ruled ever since. His extensive modernization programme has opened the country to the outside world while preserving the longstanding close ties with the UK. 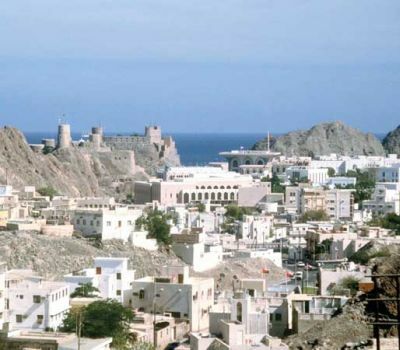 Oman's moderate, independent foreign policy has sought to maintain good relations with all Middle Eastern countries. You can fly to Oman from Europe on various carriers but the recommended way is via Oman Air, which dates its history back as far as 1970. In 2007 it was recapitalised by the government, introducing long haul services. Oman Air now is a top quality international carrier, small by anyone’s standard but like its local rivals offering typical Arab quality hospitality. For the most part both the operating and cabin crews are of national origin, with the rules flexible. An airline that flies to Bangkok needs Thai speakers. Perhaps the only criticism of a very professionally run operation is a certain lack of experience from the staff, but that will come in time. Quite frankly there is not a lot to choose between Oman Air’s First Class and Business Class. The difference is exclusivity and privacy which you gain in the front cabin where there are just six seats laid out 1+2+1, the same as Business Class. The lie-flat seats are even larger (both with easy to use controls). The digital IFE TV screens are bigger (22” against 17”) and screens slide up to give total seclusion. On European flights, in all parts of the aircraft, travellers can use OnAir’s in-flight internet and phone service, a very useful working tool to have on a long flight. The Business Class menu looks inviting and is inviting. Proper large tables are hidden away in the seats allowing the staff to offer a fine service with plenty of room for all the tableware. No wobbling either! A five course menu is provided (including an excellent soup) and a first-rate wine list too. It looks, and is, a quality product. In 1992 Sultan Qaboos directed that his country should have a Grand Mosque. Construction commenced in 1995 and the building work took over six years. The result is imposing and well worth a visit. Ladies should be careful to cover up, (head, shoulders and knees – though the heat makes this sensible anyway). The female wardens are helpful, and indeed experts in making the cover-up stylish. A major feature is the 70m × 60m carpet which covers the floor of the main prayer hall. It contains 1,700,000 knots, weighs 21 tonnes and took four years to produce. 28 colours in varying shades were used, the majority obtained from traditional vegetable dyes. Produced by Iran Carpet Company it is the second largest single piece carpet in the world. 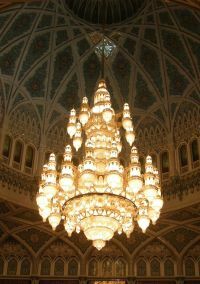 Equally striking is the main chandelier above the praying hall. It is 14m tall. OK it is not as large as the Grand Bazaar in Istanbul or Cairo's massive Khan el Khalili market, but Muscat’s souk is still an intriguing place to wander about for an hour or two, looking at the ‘bargains’ and wondering whether they were made locally or in China. Built in traditional style it offers silver jewellery, intricately hand-made ‘Khanjars’ and other handicrafts. Shoes and sports equipment, carpets, clothes, lingerie, perfumes, leather goods, trinkets and Omani silver handicrafts are available. Haggling is part of the sale. 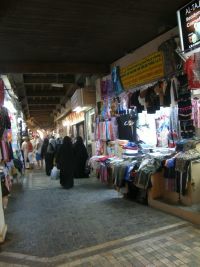 If the ancient souk is not for you (and this one is not that ancient) Muscat has plenty of fully air conditioned shopping malls, Bond Street in the desert, with the finest international cuisine close at hand. 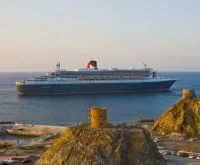 Muscat has also found its niche as a cruise port on the regular run from Dubai and also Mumbai and the Maldives. The QM2 has squeezed into the harbour. In the centre of Muscat the former home of the Al Zubair family has been turned into a museum, personally administrated by His Excellency Mohammad Al Zubair. It consists of over 5,000 specially selected, inherited or donated pieces spanning a number of centuries and regions that reflect Oman’s rich cultural heritage and unique identity. Included are traditional Omani weaponry, jewellery, costume, household utensils and furniture, early European maps and prints of the Arabian Peninsula and East Africa, early photographs, satellite images, coins, stamps, musical instruments, documents, manuscripts and books. 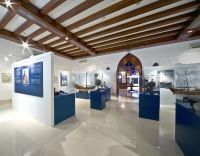 The Museum also features traditional Omani architecture, a falaj and traditional fishing vessels. Over four decades, The Zubair Corporation has expanded and diversified, bringing new business thinking from around the world into the Sultanate of Oman to help build a vibrant and modern nation. Today it is a group with over 60 wholly owned companies, subsidiaries and associates in Oman, the Middle East, India, the Far East, Europe and the USA. The Zubair Corporation's portfolio comprises investments, automotive, energy, real estate and construction, electric, tourism, furnishing, home and business solutions, information and communication technologies, cultural heritage and publishing. The progress of The Zubair Corporation in many ways reflects the development of the Sultanate, with the Corporation playing a key role in Oman becoming a respected contributor to international trade and business. 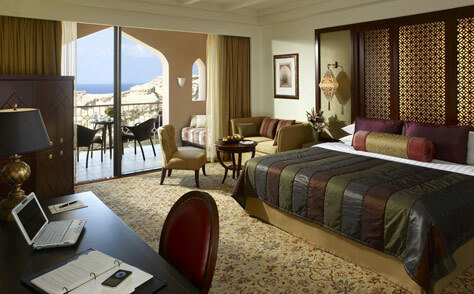 The Shangri-La's Barr Al Jissah Resort and Spa, a luxurious three-hotel resort community, nestles in a dramatic setting of rugged mountains and truly inviting beaches. It is about 35 miles from the international airport, 45 minutes, except during the rush hour. Muscat City is 15 minutes away with complementary shuttle provided. Al Husn (The Castle) is Shangri La at its best, with a level of service, amenities and privileges suitable for the most discerning of travellers. Within the complex there are eight restaurants serving a variety of both Middle East and international food. Pork is not available but the drinking rules are quite relaxed. Expatriates confirm that the Sultanah restaurant in Al Husn is one of the finest restaurants in Oman. Al Bandar (The Town) is the resort’s mid-range property. The ballroom provides banquet-style seating for up to 700 people. There are 11 conference rooms. ‘Lazy River’ provides a relaxing way of 'commuting' around the resort, simply floating along in the man-made current from pool to pool and joins the property to Al Waha (The Oasis), Oman's first dedicated leisure hotel dominated by a large swimming pool complex.